Amani Al’Hiza is poor, orphaned and female, three things that make her a lesser citizen of the dead-end town of Dustwalk. Amani dreams of escaping the town and seeing the world she’s only heard about in campfire stories. When a foreigner with no name arrives in town, she realises that with him she might have a chance to leave Dustwalk behind. But the desert is full of dangers and magic. The Sultan’s army is growing and Amani soon finds herself caught up in a deadly adventure she never dreamt she could have. The world of Rebel of the Sands is fascinating. It seems like a Arabic-American Wild West fusion with the small mining towns and the guns but then a lot of the characters names and supernatural creature are more Arabic inspired. It is great seeing how these cultures blend together to form its own unique world. Then there’s the magic that’s a part of this world, there’s the Djinn which are supernatural creatures and people who can change their appearance and have strange powers. This magic is a part of the land and how it all works is really one of the best things about the book. Amani is an interesting lead. She sometimes seems selfish as she has been forced to learn how to look after herself. When it comes to helping someone and maybe surviving, or leaving them and definitely surviving, she often takes the second option which is not something you usually see in a heroine. Amani is great with a gun and is more than capable of looking after herself but when the foreigner comes into her life she finds that maybe this is someone she can rely on. Rebel of the Sands is very action-packed, there’s fights, shoot-outs and jail breaks and it is all edge-of-your-seat-stuff. I read Rebel of the Sands in a day and it has been forever since I’ve done that. I just wanted to know what would happen to Amani next and if she’d get to this city that her mother had always told her amazing things about. I fell in love with the setting of Rebel of the Sands first, but then I definitely grew to appreciate how smart and strong Amani was. 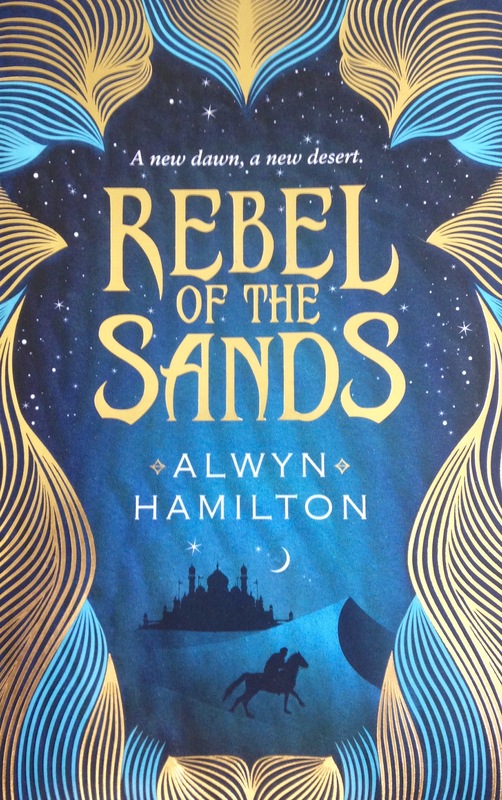 I did go into Rebel of the Sands not realising it was the first book in a trilogy so I did have that moment when I was getting closer to the end of the book and I was thinking “How is everything going to wrap up? !” but while it’s going to be a pain to wait for the next book, I’m glad I’m going to see more of this magical desert world. 5/5. This sounds amazing and unique- definitely going to have to go on the TBR pile!